You could say the folks who nicknamed San Francisco's Lombard Street were a little "crooked" themselves when they named it the "crookedest street" in San Francisco, in the U.S. — and even in the world. Despite all that hype, by some measures it isn't San Francisco's crookedest street, nor is it the steepest — and let's not go into its rank on the planet. In fact, Lombard Street is just like any other city thoroughfare, except for the enormous reputation, eight ziggedy-zaggedy turns in one block and a slope that will make a good bobsled run if it ever snowed in San Francisco. On busy days, any of the hundreds of tourists who visit this 600-foot-long, red-brick road would see a passing car every 10 seconds, up to 350 vehicles in an hour. The never-ending two- and four-wheeled stream winds downhill, passengers squealing in mock fear at every turn. If you're on foot, take the sidewalk and watch the show. For a behavioral scientist, Lombard Street would be the perfect place to study scatterbrained tourist behavior. They could take notes as distracted picture-takers block traffic, stop pedestrians, and even impede the local parrot flock flying overhead. The scientist's assistants could tally family portraits that are photo-bombed, on purpose or by accident. And biology grad students could analyze whether daily close encounters with automobile bumpers make the colorful roadside flowers feel paranoid. If it weren't for that zany tourist scene, people would be looking in the opposite direction, at a view that takes in half the city — and the street's residents would enjoy more peace and quiet around their multi-million-dollar homes. To drive Lombard, set your navigation to 1099 Lombard Street, the top of the one-way drive. Expect to wait a while before you get a chance to drive down. If you think "waiting" rhymes with "aggravating" for a good reason, go early or late in the day when fewer people are around. When it's your turn to drive down the street, don't expect to be making comments like "Bolt your socks on, honey!" This is probably the world's slowest joyride. The 5 mph (8 km/h) speed limit is only slightly faster than you could travel on foot, but still not slow enough to keep hapless, distracted drivers out of trouble. They transfer enough paint from their vehicles to the concrete walls every year to coat the entire Golden Gate Bridge. The whole trip will be over in less than two minutes, so fast that your passengers won't even have time to yell: "I feel carsick!" A walk on Lombard Street gives you more time to take in everything without worrying about accidental scrapes, discombobulated pedestrians, and barf bags. To get there, zoom in on any map and look for the squiggly section of Lombard between Hyde and Leavenworth. Tackling Lombard uphill on foot is also a good way to burn off excess calories consumed at Ghirardelli Chocolate, Boudin's Sourdough Bread, and even the cream in that Irish Coffee at Buena Vista Cafe. If you need to catch your breath or rest those aching legs but don't want to admit it, picture-taking is a perfect excuse to stop every few steps. If you fear that such a steep climb might end with an emergency room visit, take the Powell-Hyde cable car line (from Ghirardelli Square or Union Square) get off at Lombard Street and walk downhill. Or call a ride-sharing service and have them drop you off. To get an idea of what Lombard would be like without the curves, the next block over on Filbert between Hyde and Leavenworth is one of the ten steepest streets in the U.S. Even though there are already countless photos of Lombard Street posted online, you'll no doubt want one of your own. Most people do that looking up the street. Try to avoid getting someone else's uphill-bound backside in your frame. A few shots of the gorgeous views are a good idea, too. After you Instagram, Snapchat, Facebook, Tweet, text and tout your location to friends, acquaintances — and the total strangers you met at breakfast — put that mobile device in your pocket and enjoy the moment. 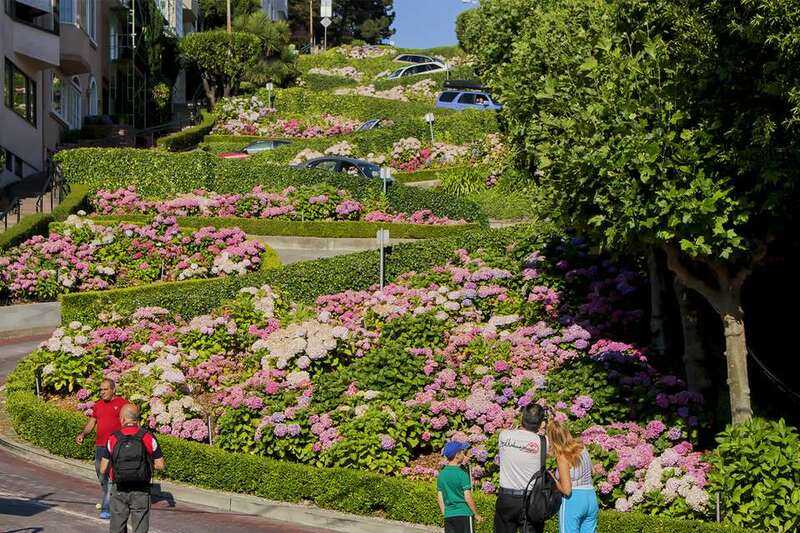 This "crookedest street" is on many lists of top San Francisco attractions. It's free to visit, and at less-busy times, it doesn't take very long. Most people love it, and your friends sitting in the back seat may giggle in delight, shouting "Hooray!" as you drive downhill. On the downside, during busy times, the wait for the short ride down can feel longer than a round trip to the moon. If you think you've gotta see it, or you won't be able to face the folks back home who told you to go, you should. If you're in the area, it's worth a stop. Will you miss an essential San Francisco experience if you don't go? Probably not. If you want to find the real most crooked street in San Francisco, try Vermont Avenue at 20th Street. You can go to Lombard Street anytime, but please respect the residents and be quiet at night. It's a few blocks up the hill from Ghirardelli Square. Allow a half hour at most to watch the people and take a few photos, longer if you want to drive down on a busy day. The flowers are nicest in spring and summer, and morning is the best time for photographs. The Powell-Hyde cable car stops at the top of Lombard Street. Here's how to catch it. You can also get there by walking up Hyde from Ghirardelli Square (very steep), up Leavenworth (one block east and less steep) or by walking west from North Beach, but the best way to get there depends on where you're coming from. Check out all the other options for getting around San Francisco.